I have been searching and searching for a new case for my iPhone lately, so I'm extra excited to share this giveaway from iconemesis today! They have cases featuring artwork from artists such as Leah Goren, Fifi Lapin, and Gemma Correll (to name a few). Iconemesis is offering up a case of your choice to one lucky winner! I absolutely love mine! I chose the bows case by Leah Goren. To enter, please visit the iconemesis site, and pick a favorite. Leave a comment here stating which one you would pick if you won! Tweet about this giveaway with: "Win a lovely iPhone case from @iconemesis on the @skunkboy blog! http://tinyurl.com/7hkozq6"
Please leave a separate comment for each entry, and make sure your email address is easy to find in case you win! The winner will be drawn on Monday, May 21st. Good luck! I like the bow case also! I absolutely love the Watercolour case! I would most definitely pick the bow case! I love it so much! My favorite is the Little Escher Blue case!!! Thanks for such a lovely giveaway! The cases are beautiful! I'm really into the Shapes and Squares cover. I've been searching for a new case! I loved the floral case! I love the layered shapes design. But they're all just so lovely! love love love the watercolor case! Oh the feathers one is lovely! Oh my gosh! I love these! My favourite is the fifi lapin cupcake case. I followed them on Twitter!! I like the Flower case by Pomme Chan for a 3gs. Thank you so much! All of them are wonderful!! Still in love with the little escher blue, but also the vintage case! I love the teacup case by fifi lapin! Bunnies and teacups? Um, perfect. I love the Tiger case! So much fury and chaos! I love the Feathers case, so simple! The bows case is definitely my favorite! I love them all! But Gemma Correll's Kitty Pattern is my favourite. Cats in party hats, what's not to like?! What a super fun giveaway! I absolutely love the Kitty Pattern by Gemma Correll! I simply love her illustrations! They are just so wonderful! Wow! My favourite is the Kitty Pattern by Gemma Correll! I also love the Teacup by Fifi Lapin! I also liked Iconemesis on facebook! I love the Quirky Floral Stems! So pretty! I love the Teacup - Fifi Lapin, So adorable! The Feathers case by Cat Sims is beautiful! The Fifi Lapin teacup is my favorite! I just got my first Iphone so I have been searching for the perfect case and the feather one by Cat Sims looks perfect to me. I would definitely choose the feather case that you show on the blog. It's adorable! Logar is my favorite. It reminds me of World of Warcraft. Oh I love them all. But I would pick the one with feathers! I love the bows case! So cute! I love Teacup and Feathers. It would be hard to decide! These are so beautiful. I love the bunny one and so many I think I'd have a really hard time deciding if I win! But I've been searching for a new case too. Haven't had much success until now! I love watercolors from Leah goren or floral from Johanna basford. 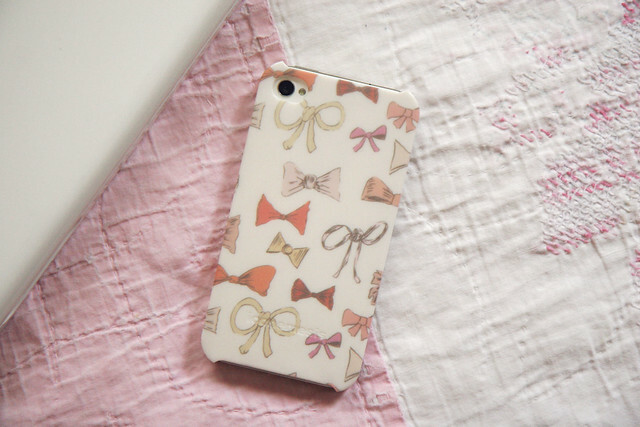 In love with the bows case! I love the Kitty Pattern and I also love Gemma Correll so I would have to go with that one! Can't get enough of cats in my life! I need a new case, too. Mine is alarmingly beaten looking nowadays. :/ I have to say, the bows one is my favorite, too! Floral by Johanna Basford is definitely my favorite! Tiger is awesome! But I love them all. Thank you SO MUCH for hosting this giveaway! These are the BEST cases I've ever seen and I'm so glad you showed them to us. If I won I'd had a hard time deciding between Bless, Flower, Majesto and Quirky Floral Stems. There are SO MANY amazing ones to choose from! Seriously, these are the best cases I've ever seen. If we don't win, is there a discount code we can use? I am in love with them! I am torn between the watercolour case, the teacup with the bunny and the polkadots, and the beautiful floral case!!! These cases are ahhhhhhhhmazing! Best one's I've seen yet. I would love to win the Fifinfawn case! i LOVE teacup. so pretty! Oh I love the feathers cover! I am obsessed with the bubble case! Amazing! Thanks for the give away! My favorite is shapes and squares. And Layered Shapes. I guess I like shapes. The feather case is so cute!! Love the colours too. The Watercolor one is my fave! I like the Anastasia case! I love Fifi Lapin's cupcake case! I love all the Fifi Lapin ones, especially Fifisonnyandstella! If I won this contest I would choose the "Tropical" by Ciara Phelan! The bows are so precious! Pinklady469@hotmail.com. I love the Leah Goren case with the cats on it! My favorite is the feathers one. This is my favourite I think http://iconemesis.co.uk/products/iphone-4/majesto-2 but it is so hard to choose! I liked iconemesis on Facebook! The fifisonnyandstella is the most charming thing I've ever seen. The fifisonnyandstella is the most charming thing I've ever seen! How do you pick?! SUCH A GREAT SITE! I love the Rainbow one. So cute! I LOVE the feathers case. It matches my tattoo!!!! I love the Fifisonnyandstella case! So cute!! Oooo the feathers one. It's so.... graceful. 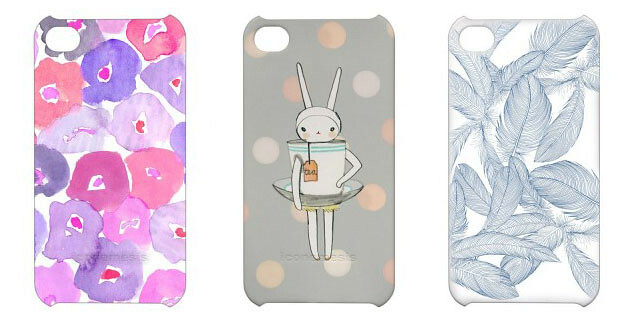 I love every Fifi Lapin case and the floral ones. But I think I'd pick the Fifi Cupcake one. I love the teacup design! Fingers super duper crossed! love love love the 'quirky floral stems'... would be perfect for the summer!! I think Feathers by Cat Sims is my favorite. the bow case is adorable. for some reason, i've having trouble accessing their site, but from what i can see, they're all cute! and i just liked them on fb. I love the bow case! So adorable. Oh I love arty Iphone cases like these! Actually I don't have an Iphone yet, but I'm getting mine in June. So excited! It's just a phone, but I'm looking forward to it. Hihi. I liked Iconemesis and now I'm off to pick my favorite one! I just tweeted about this great giveaway! I adore the Quirky Floral Stems case by Rachael Taylor. Thanks for such a great giveaway! Oh and... I just followed them on Twitter! 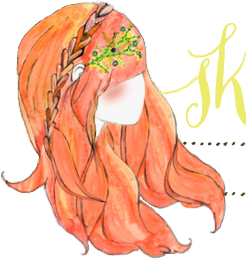 The Feathers are pretty pretty! i LOVE the feathers case!! this is a great giveaway - just got an iphone and still need a case! Such a great giveaway! Thank you Katie! I love the Waercolor flowers case! It's so pretty! My favorite is Cats by Leah Goren! Me and my little sister love cats and I really want to get her an Iphone case for her college graduation! Just liked them on Facebook ! Just liked them on Facebook! My favorite is their Tropical case by Ciara Phelan. Oh wow I just got an iphone as of yesterday and I would love to get the Catastrophy by Sun Lee Siew Loo case for it! The Bows case, I'm in love!! I think that Fifisonnyandstella is super cute! I think I will have to go with "cats" by Leah Goren. Something about it just makes me love it the more I look at it! I think I will have to go with "cats" by Leah Goren. Something about it just makes me love it the more I look at it! - Liked on Facebook. Thanks for a chance to WIN and good luck everyone, someone is going to be very happy camper. I would pick ‘How I Remember it’ as the design reminds me of Yellow Submarine, which is my absolute favourite album. So many different favorites! If I had to pick one, it'd be the Feathers! Watercolour by Leah Goren is a standout!Love love love it. I love them all . . . but if I have to choose, I would love the watercolour one! The bows case by Leah Goren is my favorite too! So cute. the fifi teacup is so darling!! love! The Kitty Pattern by Gemma Correll! Oh my word! So, so cute! And I liked iconemesis on Facebook. Hope I win! These are fabulous! I would love to have the fifiysonnyandstella case for my little 3GS, so hard to find cute cases for them these days. Feathers by Cat Sims is beautious!! My fav is the Vintage case - the doll is so cute! My favorite is 'Teacup' from Fifi Lapin! I love the Vintage case it's so cute! My favourite is Flower by Pomme Chan. So hard to choose which one though. LOVE the Shapes and Squares iphone cover!!!! I love all of Fifi Lapin's designs! I've been wanting one for a while! I'm really torn between Teacup and Cupcake by Fifi Lapin! I really like the bows one that you have too! http://iconemesis.co.uk/products/iphone-4/feathers is the bestest... totally matches my wrist tattoo.. and we all need a little more matching! Thanks! I had a hard time deciding but the teacup one STOLE my heart!!! I'm torn between bows, feathers and Navajo. Love all three! I would have to choose between the Kitty Pattern and Quirky Floral Stems. They're all adorable!! Love the cupcake cover and the bows, OMG! it's hard to choose. Love the Cupcake Cover (but they're all so cute)! !